My wedding dress was by Mori Lee. My Mam and I went wedding dress shopping and it was one of the first dresses I tried on. Mam instantly cried and that was all I needed really. I didn’t even bother to go anywhere else. I felt like a princess and didn’t want to take it off. As we were getting married in the sun, I decided on yellow for the bridesmaids’ dresses. I had looked at so many different styles and colours but decided it was only fair to let the girls choose. They all immediately agreed on the same dress and we soon found ourselves drinking prosecco after placing the order. I had my make-up trial with make-up artist Nicola on the day of my hen do in Marbella. She immediately put me at ease and was a complete perfectionist. I couldn’t have asked for any more. On the day of the wedding, Nicola took care of my Mam and me. She ensured me that my make-up would stay in place all day and it really did. Everyone commented on how perfect it was, despite the heat. She was amazing. We felt so relaxed and loved every second of it. One of my very good friends from school, Leanne, did my hair for the wedding day. We had lots of trials beforehand and she did a fantastic job on the day. It made it even more special for me. Sunshine Weddings Spain recommended Karen to look after our floral decor. I had a specific idea in mind of what I wanted and when I described this to the florist, Karen, she knew exactly what I looking for. 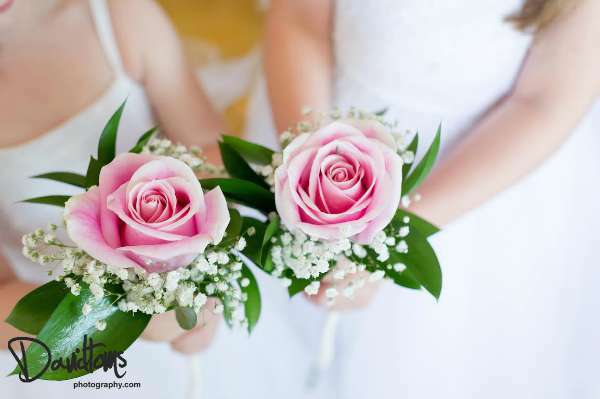 When the bouquets arrived on the day the bridesmaids cried, they were that beautiful and, on arriving at the wedding venue, the flowers were everything I dreamed of and more. The venue also looked amazing – it really did sparkle just like I had wanted it to. It was a beautiful sight. Other details included little mirrored love hearts scattered on the tables around the room with ‘Mr & Mrs Leight’ and our wedding date on them. Each of the tables were named after different places in the world we have visited – New York, Las Vegas, Los Angeles, Palma, Sydney, San Francisco, Marbella and Florence.